This book arrived when I was in the middle of another book. It was pure curiosity that got me reading the first page. Before I knew it, I had breezed through the first 100 pages! It wasn’t easy to read two books simultaneously. But I managed! The plot overall is funny, engrossing, interesting, unique, relatable, with a fresh perspective. I don’t think I could give a better plot summary than the one on the book: Shiva, 35, hotshot executive, recently divorced, disillusioned with his life and fed up of the rat race in the corporate world, topples completely over the edge after an unexpected tragic incident. 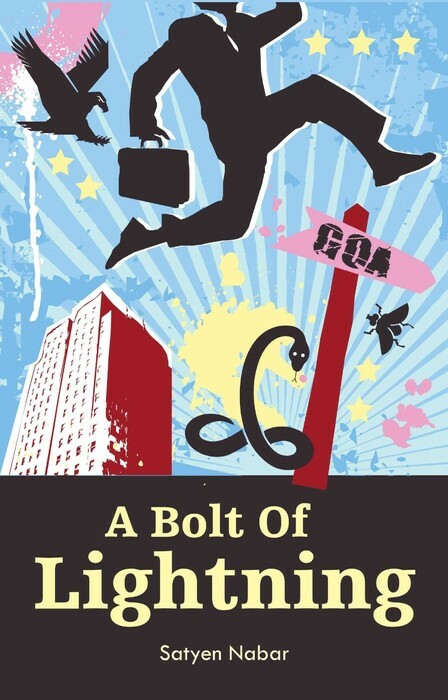 In a hilarious journey from the boardrooms of Bangalore to the hippies, face readers, casinos and rave parties on the verdant beaches of Goa, Shiva attempts to ‘escape from it all’ till his life suddenly changes in miraculous ways after an electrifying act of nature bestows him with an extraordinary gift. Anchored by the strong bond of friendship with his college mates, Sid and Adi, and propelled by love for Anita his estranged ex-wife, Shiva attempts to make the most of his incredible gift to unravel the secrets of life, death and happiness as the story races to its exhilarating conclusion in the exotic jungle valley of Arambol, Goa. And it is a “bolt of lightning” that somewhat sets things right in his life. This story is a witty and contemporary take on a midlife crisis story with an unusual twist in the tale. It at once touches the heart and entertains while offering a fascinating new perspective of the world we inhabit. The language is quite simple (mostly) but at places the author makes splendid sentences that make you smile, giggle, laugh, praise and feel jealous – all at once! The realities of present day life – building work pressures, haphazard social and personal life, meaningless rat-race, need and desire for introspection, battle to make time for oneself and loved ones, depression, loneliness, and addictions that engulf us at the end of it all – interestingly portrayed and brilliantly connected. The timeline (past and present) keeps you quite alert and awake. It keeps you hooked. it keeps you excited. The characters have been etched thoughtfully. Though I personally feel the author could’ve limited their description and habit- since they were bound to be understood / interpreted by the reader during the course of the story. Anyway, that’s just my perspective. There is much more to the story, and its characters, apart from their emotions, actions, deeds, thoughts, and behaviour. A hidden message. The eternal quest. A gripping need to introspect right away. To live in the moment. To live for the day. To follow your heart. And to read more and more! I would definitely recommend this book to all!